The agri-food sector across southern Ontario and the Golden Horseshoe is an economic powerhouse, and York Region is no exception. The region’s recently released Agriculture and Agri-food Update and Strategy report reveals that the economic impact of the entire agri-food chain in York Region is $2.7 billion; and with gross farm sales at $301 million last year (2016), the region’s agriculture and food processing sector proves to be growing strong. 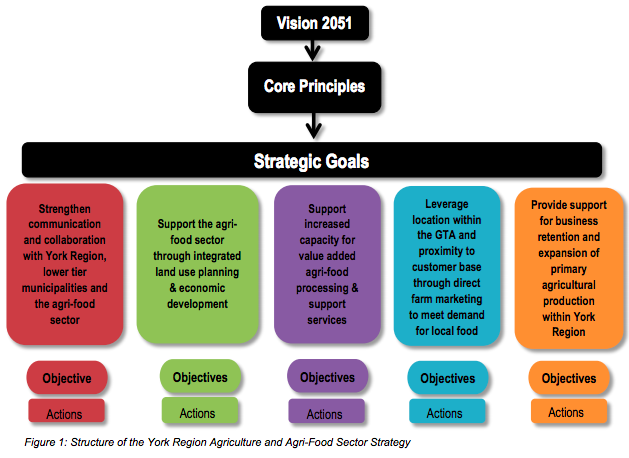 Last week, York Region Council endorsed an Agriculture and Agri-food Strategy, which has been developed to provide direction for the long-term growth of the agricultural and food production sector in the region, including future policy development, initiatives and resource allocation decisions. To help inform the development of the strategy, York Region staff collaborated with the York Region Agricultural Advisory Liaison Group (which was established in 2001), as well as a third-party consultant, Synthesis Agri-food Network, to survey industry stakeholders — 140 individuals, including food producers, restaurant industry members, and residents, provided their feedback. There are currently 3,578 full-time equivalent jobs in York Region’s primary agricultural production, and 57,000 jobs in the full agri-food sector. Indisputably, it is a sector worth securing and strengthening, and a thorough strategy is an important step. Bravo to all involved. You can view the full York Region Agriculture and Agri-food Update and Strategy report here.